ERIE, MI (October 28, 2018) – Chad Blonde (Litchfield, MI) was honored as the 2018 Engine Pro Sprints On Dirt presented by ARP Champion with points cash and awards of $9,420 of the $41,095 distributed to the top finishers in 2018 points. Shawn Valenti (Fostoria, OH), finished 2nd in points and earned $6,839. Jay Steinebach (Hudsonville, MI) finished 3rd and earned $4,576. Eric Smith (Lakeview, MI) received $1,133 for 12th place. The banquet payout brought the 2018 season total for contingency cash and awards to $90,876. For the 3rd year, the banquet was held at the Battle Creek (MI) Holiday Inn. Wayne Bunn was the emcee, Kathie Naida was the event planner, and Pat Holzinger, Marcus Berglund, Mike Russell, and Tim Beebe presented the night’s awards. Julie Beebe distributed door prizes. Joining in the celebration were SOD marketing partner Scott Benic (Benic Enterprises), John Berglund (JohnnyB Imagery), and Scott Menlen (Motor City Racing Promotions). 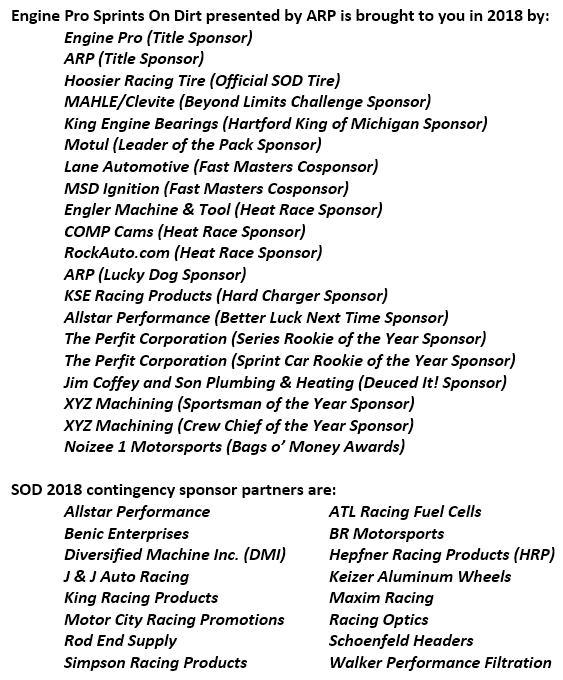 Butler Speedway, Hartford Speedway, Crystal Motor Speedway, Tri-City Motor Speedway, and Berlin Raceway were recognized as SOD promoter partners in 2018. Shawn Valenti took the MAHLE/Clevite Beyond Limits mini-series championship, collecting $1,000. Chad Blonde, Thomas Schinderle (Berkley, MI), Ricky Ferkel (Mt. Pleasant, MI), and Jay Steinebach each shared a portion of the point fund. Chad Blonde led the King Engine Bearings King of Michigan mini-series championship, worth $1,000. Shawn Valenti was 2nd, Jay Steinebach 3rd, Dustin Shriver 4th, and Ricky Ferkel 5th and each shared a portion of the point fund. Chad Blonde also won the Hog Creek Showdown mini-series championship and earned $1,000. Shawn Valenti was 2nd, Butler Speedway track champion Boston Mead finished 3rd, Josh Turner took 4th and Jay Steineback 5th. Each shared a portion of the Hog Creek Showdown point fund. The MOTUL Leader of the Pack divided the season into 4 stages and the driver with the best average finish in the stages was crowned champion. Once again, Chad Blonde took the $1,000 championship. The other drivers sharing the MOTUL Leader of the Pack point fund are Shawn Valenti, Jay Steinebach, Ricky Ferkel, and Ryan Ruhl. Ryan Ruhl was recognized for winning the most Lane Automotive/MSD Ignitions Fast Master awards with 6. Chad Blonde won the most Engler Machine and Tool heat races with 3, Ryan Ruhl won the most COMP Cams heat races with 3, and no driver won more than 1 RockAuto.com heat. Chad Blonde won 4 KSE Racing Products Hard Charger awards and led the way in feature wins with 4. Shawn Valenti won the 2018 SOD Series Rookie of the Year award sponsored by Merritt Speedway. Shawn is extremely versatile and will race anything with four wheels on dirt. He has enjoyed much success in Ohio & Indiana in dirt trucks and super streets as well as sprints. Josh Ward followed in big brother Justin’s footsteps, earning this year’s SOD Sprint Car Rookie of the Year award sponsored by Merritt Speedway. Justin won the award in 2016. XYZ Machining, Tim & Cindy Norman, recognized Justin Ward (Benzonia, MI) as this year’s Sportsman of the Year. Justin has now been racing full-size sprints for three years and presents a level of professionalism that represents SOD well. Justin, his father James, and brother Josh were committed to running the entire 2018 SOD schedule in spite of a lot of travel and frequent threatening weather. Justin was presented with a MAC 24-piece hand tool set compliments of Jeff Schejbal and Noizee 1 Motorsports. XYZ Machining, Tim & Cindy Norman, recognize Sean Robinson as this year’s crew chief of the year. Sean made sure every time SOD champion Chad Blonde went on the track, his equipment was in top shape. Sean quietly went about his business without any drama and SOD is honored to recognize his efforts. Sean was presented with a MAC hammer set compliments of Jeff Schejbal and Noizee 1 Motorsports. JohnnyB Imagery also presented Sean with a large metal print of the NEFCO Metal Sales & Fabrication 5B Maxim powered by Krieger Engines. 1st place Chad Blonde, trophy sponsored by NEFCO Metal Sales & Fabrication. JohnnyB Imagery recognized drivers with perfect attendance through the 2018 points season with large metal prints of their cars. The drivers are Chad Blonde, Shawn Valenti, Jay Steinebach, Ricky Ferkel, Justin Ward, and Josh Ward. Mark Aldrich received a large metal print for his 38 years of dedication as a sprint car driver. SOD officials in attendance were recognized and thanked for their hard work. The officials were flagman Tim Beebe, scorer Julie Beebe, infield and tech official Marcus Berglund, event manager Pat Holzinger, tire sales and contingency manager Kathie Naida, and pits official Mike Russell. Hoosier Racing Tire and Hoosier Tire Midwest were recognized for their dedication and support in making the SOD “beyond limits” format successful. Jim Coffey & Son Plumbing & Heating and Steve Smith were recognized for sponsorship of the 2018 Deuced It award that presented $100 to the 2nd place finisher in every SOD feature. Hoosier Racing Tire – Set of SOD spec tire to the champion, jackets to the champion, series RoY, sprint car RoY, and 3rd place in point. Walker Performance Filtration – Complete set of stacks & filters, 40% off a set, a cleaning kit. Simpson Race Products – Driver gloves, hood, underwear top, underwear bottom, gear bag. Ti22 Performance – Set of front spindles, set of front hubs, front axle. Hepfner Racing Products – Wing certificate. Maxim Racing – Contingency certificates. Noizee 1 Motorsports – MAC Tools sets, cash awards. Schoenfeld Headers – Header set certificate. 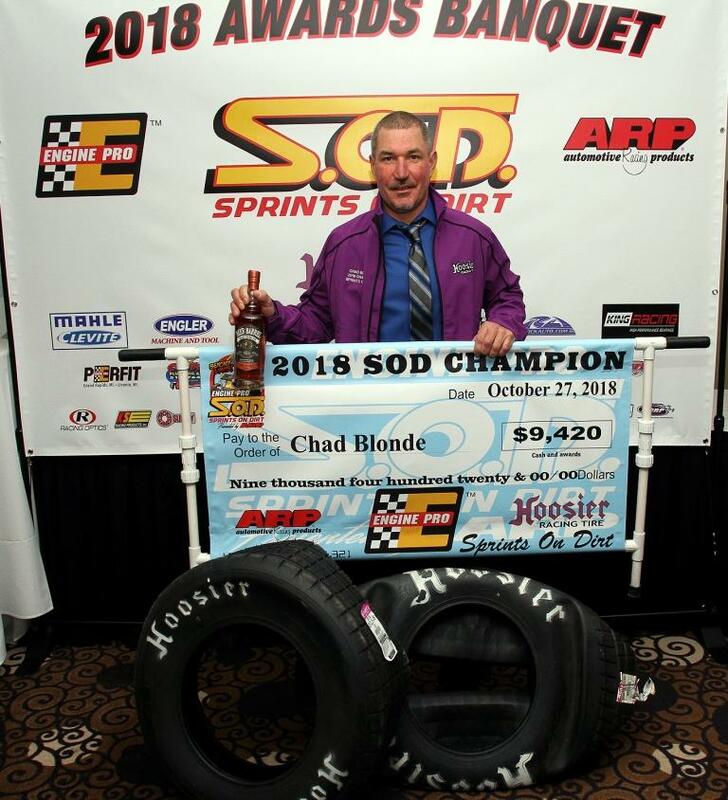 In spite of 6 rain outs and several other races impacted by inclement weather, Sprints On Dirt still paid points money and awards to Sprints On Dirt Champion Chad Blonde of $9,420 as well as points money and awards to Sprints On Dirt competitors of $90,867 for the 2018 season. It was a bad year weather-wise but the 2018 payout increased over 2017 by 19% thanks to increased support from our marketing partners. Sprints On Dirt extends its deepest appreciation to our title sponsors Engine Pro and ARP for making it all possible. 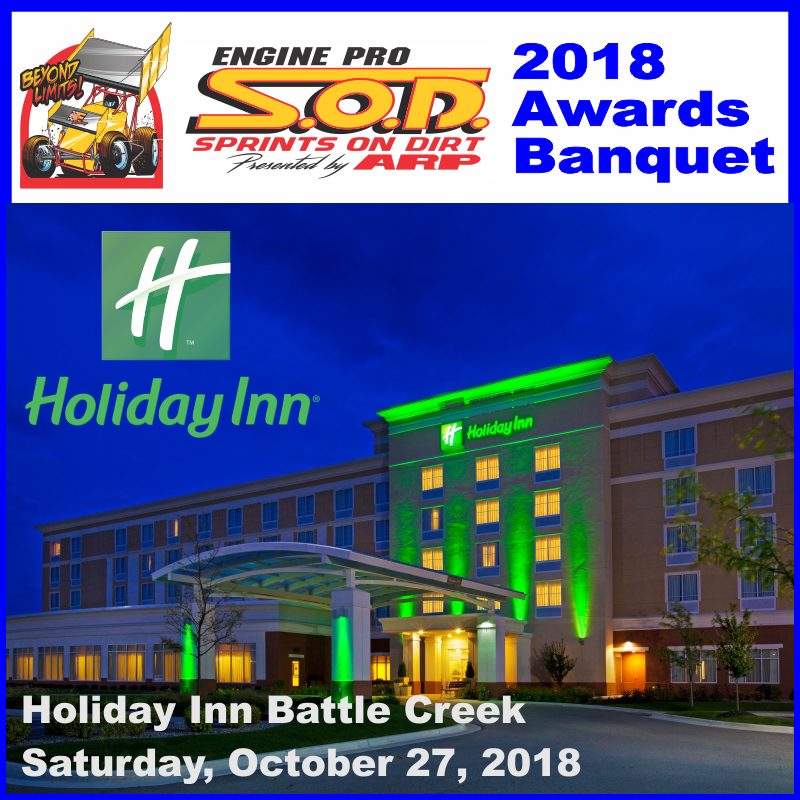 ERIE, MI (October 3, 2018) – The 2018 Engine Pro Sprints On Dirt presented by ARP Awards Banquet will take place at the Battle Creek (MI) Holiday Inn on Saturday, October 27th. Shawn Valenti will be honored as The Perfit Corporation Sprints On Dirt Series Rookie of the Year for the top finishing driver who has previous sprint car experience, but ran their first season with Sprints On Dirt. Josh Ward will be honored as The Perfit Corporation Sprints On Dirt Sprint Car Rookie of the Year for the top finishing driver who is a first-year sprint car driver. The 2018 XYZ Machining Crew Chief of the Year and the 2018 XYZ Machining Sportsman of the Year will also be announced and honored at the banquet. 2018 points money consists of the season championship point fund, the MAHLE/Clevite Beyond Limits Challenge, the King Engine Bearings King of Michigan, the Hog Creek Showdown, and the Motul Leader of the Pack. The top 5 finishers in each will also be recognized at the banquet. Racers, teams, friends, fans, everyone is invited to attend the family-friendly banquet. Tickets are $35.00 per person and must be purchased by Thursday, October 18th. For full banquet information and to order tickets, click here. Would you like to sponsor one of SOD’s custom-made trophies? 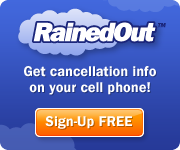 Call 734-309-RACE (7223) or email director@sprintsondirt.com for more information.